You may have read about a hormone called leptin, especially if you’ve looked into The Venus Factor. More and more research now confirms the significance of leptin for weight loss. In this brief post, I’ll give you a introduction to what leptin is, why it is important, and for many of you: why you’re diet is plateauing after a while. This will further explain common diet problems, such as food cravings. I am against experiments on animals, but this was the best illustration I could find. It’s from one of the research papers I read prior to writing this post. These two mice were being fed the same, but one was unable to produce leptin — causing it’s severe overweight. 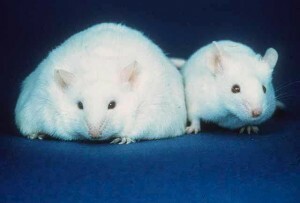 A mouse unable to produce leptin (left), therefore storing fat, and a healthy mouse (right). Leptin is a molecule, a hormone, which is released from your fat cells (odipose tissue). We don’t know everything about it yet, but we do know that it is a key brick in the weight loss puzzle. The amount of leptin released, is proportional to the amount of fat you have on your body. Basically: more fat equals more leptin. For practical purposes, we can think of it as a signaling hormone that tells your body “Hey, you’re overweight! Eat less!”, or “You’re too skinny, eat more”. By promoting the production of a-MSH, an appetite suppressant. Generally, overweight people should be less hungry. Higher leptin levels, signaling that they “have plenty” should leads to a lessened feeling of hunger. Also, leptin levels respond to short-term shifts in energy balance. A severe caloric deficit, will decrease your leptin levels — signaling your body to eat. Overfeeding will do the opposite, boost leptin production, and make you feel full. Why don’t overweight people respond to this leptin? And why are people overfeeding, despite increased leptin production? Why is there a discrepancy between the text-book world and the real world here? The problem is not the secretion of leptin. Studies have shown that the majority of overweight men and women who are having problems losing weight shows a leptin resistance. They are unable to get the stimulating effect of leptin. This resistance is sensed as starvation — pertinent to what you would feel if your leptin levels were low. This tells your body to increase fat stores, rather than burn them off! So, we’re eating more than what we need, an excess of food. Still our bodies will tell us that we’re starving, and to eat more. Do you see how this can lead to weight gain? With leptin resistance, you will crave food even though your body don’t need it … It will make your diet ten times harder. How does it affect my diet? All diets, from low-carb and Paleo to soup and shake diets will influence leptin levels. However, most diets don’t mention it … It’s just something happening behind the curtains. Most diets are focusing on calories only; It’s easier. It breaks down weight loss to a simple 2+2=4 — But it’s not entirely correct. Don’t mistake me: calories is the most important aspect of any diet. However, by not considering leptin you’re swimming upstream. I will get back to you in a few days, when I have better time, to write more on leptin resistance. Make sure you sign up to my newsletter to stay in the loop and get the latest updates!